Kim Pinkham moved from Vancouver, B.C. Canada, and attended colleges at Lake City C.C., Florida and Thomas University in Georgia where she played softball. Coach Pinkham has taught health and physical education for the past 15 years at Lemon Bay High. Coach Pinkham is married and has a 2.5 year old son. 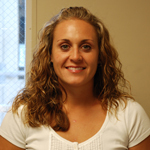 Coach Pinkham has been the head coach for Varsity softball for the past 15 years.